ST. MEINRAD—Surrounded by the stillness and beauty that one often finds in the wooded hills of southern Indiana, Benedictine Brother Martin Erspamer works quietly in an art studio just down the hill from Saint Meinrad Archabbey. He seeks to make beautiful works of art that will lead others closer to God. 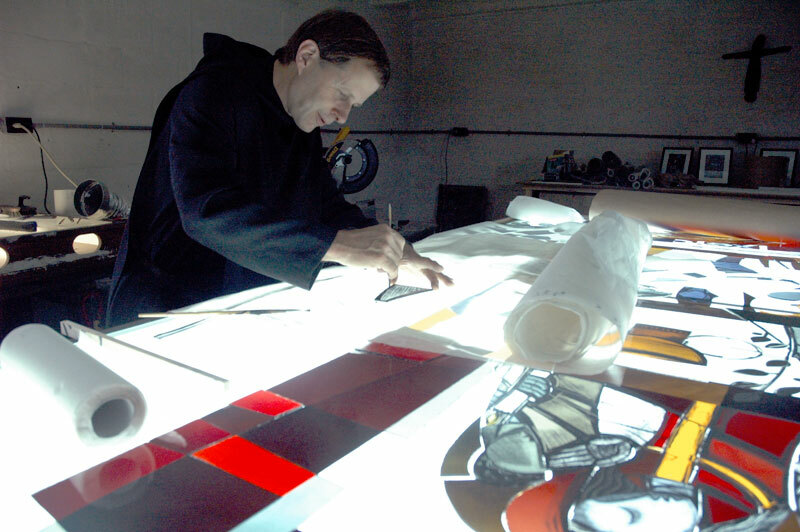 Brother Martin has created stained-glass windows for churches across the country, using methods and tools that have largely remained the same as those used in the Middle Ages. He has also sketched thousands of drawings in a largely medieval style that have made their way into missalettes and worship aids used by millions of Catholic Americans. How he came to join Saint Meinrad Archabbey is, in a sense, itself a work of art. Brother Martin joined the Marianist order in 1971 when he was 17. At the time, he was drawn to artistic work and liked the fact that the Marianists had brothers who dedicated themselves to art. For periods, he studied art in Boston, worked as an artist in St. Louis and helped extend his order into India, where he also took in some of the fine points of traditional Indian art styles. He soon began to work with Emil Frei Associates, the St. Louis-based stained-glass studio that, decades earlier, had created the stained-glass windows in Saint Meinrad’s Archabbey Church. Brother Martin also continued to create pottery and liturgical furniture. In the mid-1990s, the monks of Saint Meinrad were planning the renovation of their church and Brother Martin, still a member of the Marianists, agreed to create a triptych—or three panels of paintings—about the life of their holy patron. He came to Saint Meinrad for meetings on a nearly monthly basis in 1995. It was during that time that he started to consider that God might be calling him to live out more fully a contemplative and monastic impulse that had kept re-emerging within him for years. Although attracted to the life of the monks at the time, it would be 10 more years until he joined the community. If the solemnly professed monks of Saint Meinrad approve, Brother Martin will profess solemn vows in the community in August. Still, he looks back on that experience of creating the triptych, which stands today at the entryway from the church into the monastery, as a key point in his monastic discernment. “I worked on the renovation of the church, and the Benedictines worked on the renovation of me,” said Brother Martin, who acknowledged that he is still a work in progress. Although Saint Meinrad Archabbey stands in a long Benedictine tradition of promoting beauty in its liturgical music, churches and other monastic buildings, Brother Martin was attracted to the community by seeing beauty there in a much wider scope. Benedictine Father Harry Hagan, Saint Meinrad’s novice and junior master, is Brother Martin’s superior. He also worked with him in 1995 on the renovation. Father Harry thinks that beauty is an important way that people can be drawn closer to God. For Brother Martin, the actual process of creating something that is beautiful can draw him close to God. “When you create something, I think it’s probably as close as a human being can get to being like God in some way,” he said. Brother Martin sees his work as an artist as his apostolate, as his way of proclaiming the Gospel and attracting others to God. But he sees himself doing this ­evangelizing in an indirect way. The work of Brother Martin’s hands may be evangelizing on a broader scale in the months and years to come. A collection of photos of his artwork has recently been published by Oregon Catholic Press. Titled The Work of Our Hands: The Art of Martin Erspamer, O.S.B., the book includes photos of art that Brother Martin has created for books and other publications, stained-glass windows, liturgical furniture and pottery. “I hope people enjoy looking at them,” Brother Martin said. “I hope they find them inspiring. I tend to look at my own artwork as once they leave me, they live or die on their own. I wish them well.